Do you want to gain from clicks through your site from Twitter? How about gain a steady following on the platform over time? The thing is, a lot of companies and brands spend a lot of time on it, and yet don't get the results that they want. Their followers don't grow, and their posts aren't highly targeted either. Only a few people click on their links. So, of the same situation is happening to you, it's time to make necessary changes. In this post, we'll teach you the ways on how you can make the platform a lead-generation powerhouse. Twitter is a platform where users can freely express themselves (within reason, of course) and that applies to your brand as well. That's why it's excellent if you want to promote your brand tone in a more authentic, and personal away. So give your audience an insight into who you are, and what you think. For instance, if you're a sportswear brand, you can start a commentary about a significant sporting event in your area. Meanwhile, if you're in the building niche, you can comment on the world's most impressive structures. The platform lets you easily widen its talking points, allowing you to draw more attention to your brand. When you partner with influencers, you're creating an excellent opportunity to gain more followers, drive more engagement and traffic to your site. So if somebody is already an influencer in your niche, chances are, they already have the audience that you want. Moreover, approximately 40 percent of Twitter users say that they bought something because of a tweet from an influencer. Therefore, influencer marketing is a powerful tool. Before reaching out to influencers, it's best to reach out to your target audience first and discover their hobbies and interests. Then engage with honest relationships with influencers by engaging them in conversations. You can utilize influence measurement tools such as Twellow and Klout (before it closed in 2018, although the data is still available). That way, you can engage with those who have higher authority. Photos are important to engage more with your audience. Now is the age to "get visual." Texts alone don't make the cut anymore. Do you know that videos and photos get about three to four times more clicks? Moreover, in a survey commissioned by Twitter, then the inclusion of video tend to generate 2.5 times more replies. That shows how visuals are powerful in attracting and engaging your audience. Hashtags are an excellent way to organize your tweets around a particular topic or keyword. These are native to Twitter, so don't hesitate to use them often. However, keep in mind to not use more than two or three per tweet. The platform automatically hyperlinks the hashtags, to reveal all the tweets that are associated with them. Viewing the tweets and clicking on the link is a great way to discover other relevant content, which you can share. You can also use it to look for prospects who are interested in your products, business, and services. Twitter is built to be a two-way street. Converse with prospects so that they will talk right back to you. When you manage this correctly, you can create a more positive experience. For these interactions to thrive, make your Twitter account more conversational. Remember, people that receive replies feel a lot better than those that don't ‒ it also creates a positive vibe for your brand. The perfect combination here is to make yourself heard while pleasing customers and attracting attention at the same time. Reply to tweets about your business or brand, whether they are positive or negative. Do it within the 24-hour timeline. You can also opt to like or retweet positive messages, by thanking those who praise you. Then, you can address more critical tweets in a more respectful and helpful tone. When it comes to the frequency, there is no magic number on how often you tweet. But ideally, tweeting at least once a day is a good way to start. Then, after some time, test out various posting frequencies and see what works out the best. If your budget still allows it, using Twitter ads can give you significant results. Twitter adverts usually target your customer based on their Twitter activity. Then, you are charged based on the relevant action taken. Promoted tweets usually have a significant potential to generate massive amounts of engagement. Through promoted tweets, you can effectively target your audience. However, if you fail to define who and what are you trying to reach directly, this can cost you time and money. Also, see to it that those tweets aren't spammy. After all, your goal here is how you can build trust and credibility with your audience, and not to trick them into clicking on the link. As these tweets don't run long, if you want to send your message across, always resolve to keep it fresh. Always find a slightly different way how to say it. You can utilize Twitter's native analytics to get a good grasp on what's resonating and what isn't with your followers once you've built it. Found on the analytics dashboard, you'll know what the best days to tweet, the kind of content that are favored, and the kind of demographics that you're attracting. Afterward, you can replicate what's working. You'll also get the chance to rework and re-evaluate posts that aren't going well. Twitter analytics also lets you monitor the interactions with other Twitter users and other key metrics. It can even show you the top 10 interests of your followers, and the peak times of the day that's most successful in driving engagement. On average, Twitter sees approximately 6,000 tweets per second. So while you feel that you might need to stand out, you don't have to be viral straight away. The key is to know the platform at heart, let users know you more, and you'll turn out to be a winner in no time. You can take these suggestions into the heart to launch or relaunch your business or brand's presence on Twitter. Moreover, partnering with a Twitter marketing agency in New York better helps you better utilize the platform so that you can grow your following, traffic, and sales. 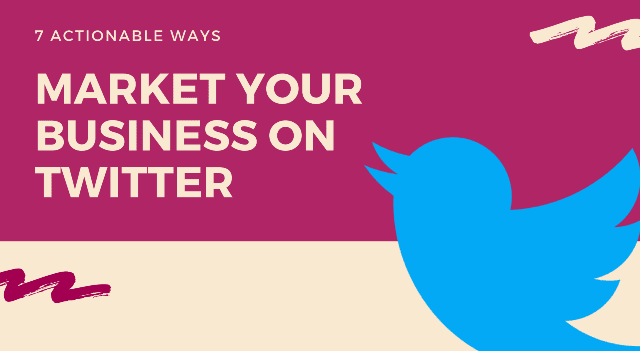 I hope you enjoyed this blog post about actionable ways to successfully market your business on Twitter with social selling. Interested in more articles about Twitter social media marketing?